The foundation stone of the new Chapel at Gibraltar, in the neighborhood of Stewart Town, in the Parish of St. Ann, was laid on 6th August. It is in connection with St. Thomas church in Stewart Town. The stone was laid by Mrs. Johnstone of Stewart Town (widow of the late Dr. Johnstone), and the following gentlemen spoke: The Revd. F. L. King, Curate of Brown's Town; Mr. C. C. Douce, Catechist and Lay Reader at Albert Town, and Mr. J. Lothian, member of the Church Committee for the district. 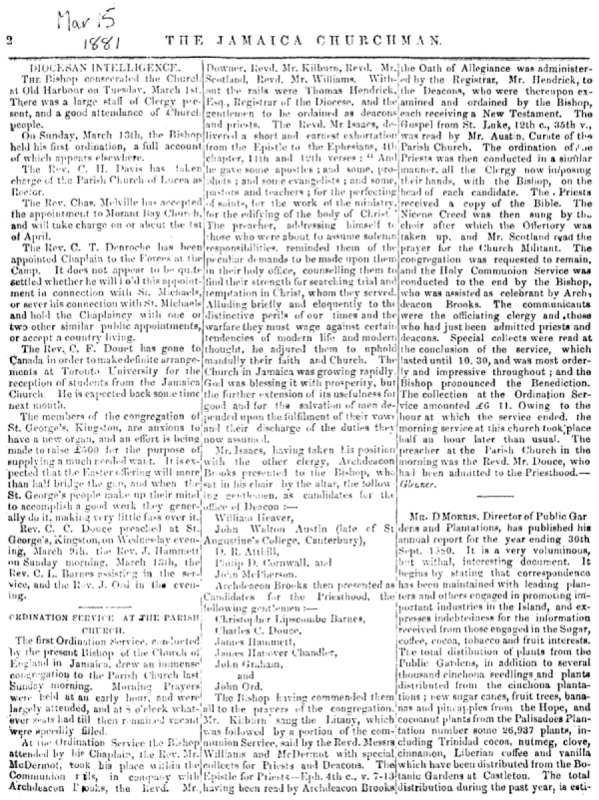 In 1876 the catechist and lay reader from Albert Town, along with two others, became a candidate for ordination as a deacon in the Church of England without the expectation of later being ordained to the priesthood. At the end of 1880 the deacon at Albert Town left the cure where he had served so well in order to be ordained to the priesthood by the newly chosen Bishop of Jamaica, Enos Nuttall. 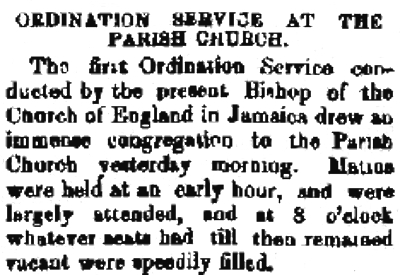 Reports in the Daily Gleaner and the Jamaica Churchman in March 1881 make it clear that in the very first ordination of his episcopate Bishop Nuttall ordained two Black men - C L Barnes and C C Douce - to the priesthood, although no mentioned is made of the colour of any of those ordained. St Andrew Parish Church: The sermon on Sunday morning at the St Andrew Parish Church was preached by the Right Revd. 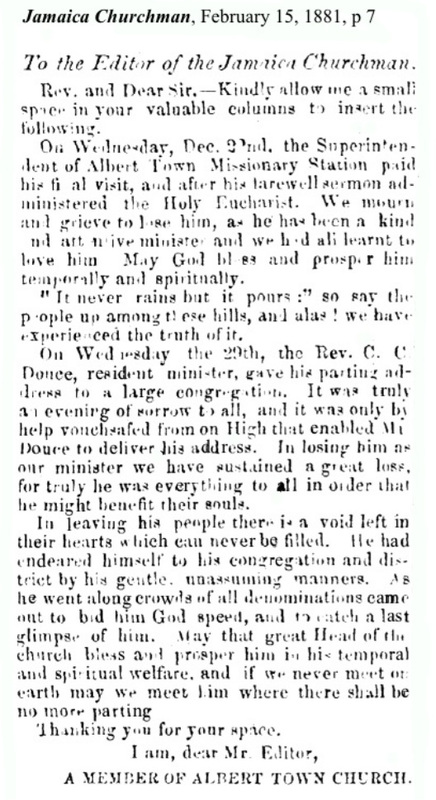 Enos Nuttall, D.D., Bishop of Jamaica, and the lessons were read at both the morning and evening services by the Rev C. C. Douse [sic], Rector of Manchioneal. Mr. Douse is a black gentleman of education and culture, and his impressive reading of the beautiful service of the Church of England was much admired by the congregation. A L 'Teacher' Walcott, the Black headmaster, and Anglican catechist, speaking on the history of West Branch School, and Douce's time there as a teacher.